In the Screenshot panel you can toggle between taking the whole screen or just the active window and decide if the window border and mouse pointer should be included. You can also enter a delay before a screenshot is taken. Below that you set the name, format and location for the screenshot that will be used when you click Save. Instead of saving the file to disk you can also decide to Copy to clipboard to be able to paste the shot directly into another application, or take a New screenshot. 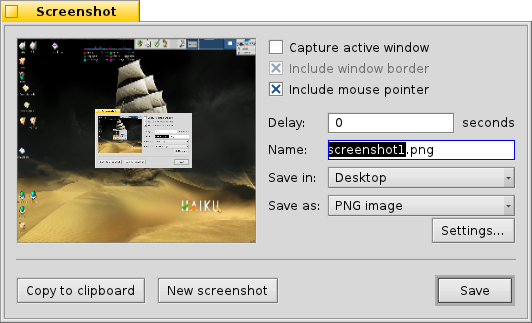 There's a special screenshot application to be used from Terminal or a script.